January marks the official start of National Train Your Dog Month, but you can teach your dog new things at any time of year. We all love our pets, but sometimes it can feel like your dog is incapable of learning any tricks. While it may feel impossible at times, with the right techniques and proper amount of practice just about any dog can learn. Committing yourself to teaching your dog some tricks is a great New Year’s resolution, but it’s also a fun bonding experience for you and your dog throughout the year. Watch the following videos to learn some simple techniques that make it possible for any dog to learn tricks. Yes, your dog may already shower you with kisses on a daily basis, but now you can actually teach them to kiss you on command. This video walks you through the training process step by step, showing you how to eventually work up to the final kiss. For this trick you’ll need something sticky like tape or a post-it, treats, and a clicker. The dog in this training video not only learned how to kiss his owner, but he even learned to kiss his cat friend! This trick might be for more advanced dogs and takes some extra patience, as it’s one of the tougher tricks. As the video shows, you have to be diligent in waiting for your dog to bark by himself first, and then reward them as they continually do it. The dog in the video doesn’t bark immediately even though the trainer is a professional, so make sure you remember that it won’t happen right away. However, if you can master it, barking on command is a very unique trick that will definitely impress your fellow dog owners. The “Shake Hands” trick is definitely one of the cuter tricks your pup can learn. It is quite simple and is actually one of the easiest tricks to teach. The secret is that your dog will already naturally paw at you if they want something. When you present a closed fistful of treats, your dog will be compelled to paw at your hand since they can’t get the treats with their mouth. 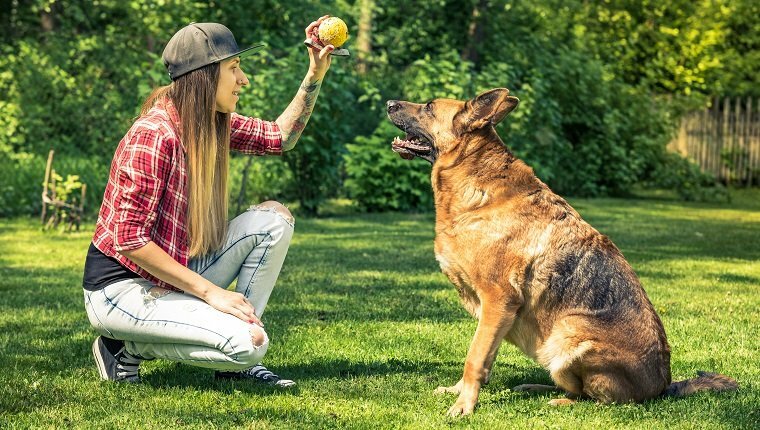 Once they continue to paw, begin to use the command “Shake,” and after repeating it several times, your dog is sure to learn a brand new trick. While fetch is a classic game, for some dogs it’s a trick that doesn’t come naturally. It can become pretty frustrating when your dog won’t cooperate at play time. Some dogs are uninterested in the toy and don’t even want to try, some will go fetch the toy but not bring it back, and then there are the stubborn dogs who bring the toy back but then won’t let go. Watch this tutorial to see how you can get your dog interested in fetch in the first place, and then actually learn how to play fetch properly. At first “Roll Over” may seem like a difficult trick to attempt, but in the long run, it is incredibly straightforward. All this trick demands is repetition. The more you do it, the better your dog will get. The video explains that the secret of “Roll Over” is doing it in three steps. Make sure you precisely lead your dog through each step, and before you know it, your friends will be asking you to teach their dogs for them! “Playing Dead” is a great party trick that will most definitely impress your friends and family. Unlike simpler commands like sitting or shaking hands, playing dead takes a bit more time and persistence to master. This tutorial uses a backwards method approach, teaching the last part of the trick first in order for the dog to learn easier. Take your time and remember to reinforce with a clicker and treats to make the process faster. If your dog already knows the trick “Roll Over” it will be much easier for them to learn this trick. Getting your dog to spin on command is a staple dog trick. While seemingly complicated, making your dog spin when directed can be done very easily with the right technique. The instructor in the video shows you how to begin with treats and eventually get to a verbal command only. However, getting your dog to spin with a verbal command only can be pretty difficult for beginners, so even if you get your dog to spin with a hand cue or treats, it is still an accomplishment to be celebrated. While this trick may seem like something to leave to the professionals, if you are a dog owner who is persistent, patient and has high determination, it is definitely doable. In comparison to tricks like “Shake Hands” or “Spin,” this trick may seem complex, but really it is just as easy to achieve if you put the work and effort in. Big or small, any dog is capable of learning this if their owner is just as determined. Making your dog “Sit Pretty” isn’t just fun because it gives you the chance to take cute pictures of your pup to post to Instagram, but it’s also a great exercise for your dog. Making your dog strike an adorable pose helps with your dog’s balance and can build core muscles. However, make sure your dog is healthy for this trick because it can strain dogs with pre-existing conditions. While you can always just give your dog a hug, this trick is neat because your dog will actually put their paws around you and hug you back. Who wouldn’t want to learn this adorable trick? If you want to master this heartwarming hug just remember to be understanding of the pace at which your dog learns. Also, keep in mind that it is a bit simpler for your dog to learn this trick if they already know “Sit Pretty,” but otherwise it is still very manageable. What fun tricks does your dog know? Are you planning to teach your pup any new tricks? Let us know and leave a comment below!